Khanka Lake (xìng kǎi hú 兴凯湖) is a transboundary freshwater body located on the border between Heilongjiang Province, Northeast China and Primorsky Krai (bīn hǎi biān jiāng qū 滨海边疆区) (the extreme South-Eastern region of Russia), Russia. 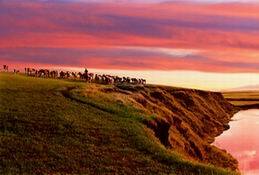 It is situated 120 kilometers from Jixi. The area of the lake is 4,190 square kilometers of which 3,030 square kilometers are located in Russia, and 1,160 square kilometers in China. The lake supports high biodiversity (especially migratory birds) and is characterized by complex hydrology and naturally-occurring high turbidity, as well as a fragmented institutional authority responsible for its management. 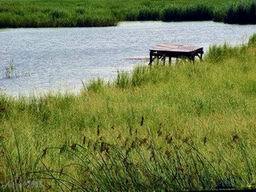 It is a remarkable site for nature protection, eco-tourism as well as scientific research (concerning bird migrations). 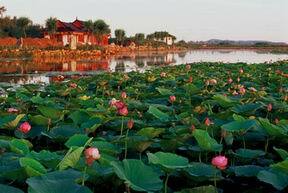 Khanka Lake was once an inner lake in China. After the signing of Sino-Russia Convention (zhōng é xié ding 中俄协定) of Peking in 1860, the lake became Sino-Russian Boundary Lake. As history recorded, Khanka Lake was called Meituo Lake (méi tuó hú 湄沱湖) in the Tang (táng 唐) Dynasty and was called Beiqin Sea (běi qín hǎi 北琴海) in the Jin (jīn 金) Dynasty. 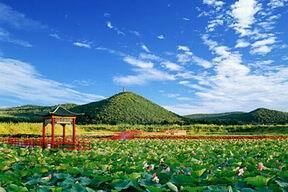 In the Qing (qīng 清) Dynasty, it renamed again to Khanka Lake. In Manchu language, Khanka means the water flowing down from a higher to a lower place. Khanka Lake is composed of one large lake and one small one which are divided by a sandy hill. The trees on the hill are luxuriantly green and elegantly beautiful. The small lake is quiet and peaceful with fish swimming around and birds flying. Occasionally, there’re some sailboats traveling on the lake. The larger lake is with vastly mist-covered water and the boundless water seems blending with the sky. It was praised as the emerald of north China as its vigorous and boundless water. In 1996, Mr. Jiang Zemin (jiāng zé mín 江泽民), the Secretary General of China and Russian President Yeltsin subscribed the Sino-Russia Agreement on Khanka Lake Environmental Protection. 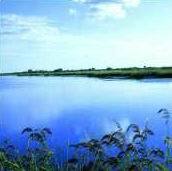 Since then, Khanka Lake became a Nature Reserve protected by our government and Russian government. 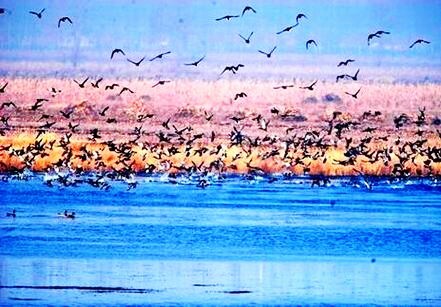 In spring, Khanka Lake is a paradise for migrants. As it is the main route of migrant in the east, every spring, thousands of migrants fly past here, take a break and look for some food. In summer, the lake is a summer resort owing to the fantastic scenery. 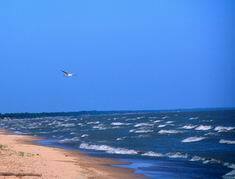 The lakeshore is a vast sand beach continuing hundreds of miles. You can paddle in the lake and fight against the storming waves. You can enjoy the cool in the umbrage on the sandy hill; feel the wind breezing near your face; taste the delicious roasted fish while appreciate the wonderful scene which will make your mind suddenly enlightened. It will be a great experience if you could drive a boat floating on the lake, look over Bee Mountain and look down the plains and villages on the foot of mountain. All these euphoric view will make you seem to be in a dream. In autumn, Khanka Lake is really colorful. Take an overlook from the top of a hill, green water, white clouds in the sky, red autumnal leaves and trees will come into your eyes immediately. On the sides of road leading to Khanka Lake, plump paddy lows down their hands in the farmland stretching to the horizon. Taking a walk in the woods, you will hear the fallen leaves rustling under your feet. The red leaves of wild grapes and hawthorns will enchant you deeply with the sweet, lightly acid smell of the fruit. You may encounter with Khanka spotted deer in the forests along the lake. The voice of deer, companied with the autumn wind, sounds melodious. In winter, Khanka Lake is covered by thick ice and looks like a silver kingdom. 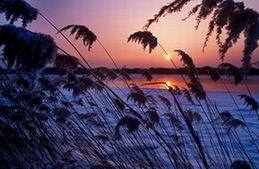 On the vast lake, ice covers with snows and expresses an extensive atmosphere. At the mouth of Khanka Lake, you can find that the Songacha River (sōng à chá hé 松阿察河), with the contrast of the sunrise, the steam of the river water wanders like a giant dragon in the air. The fog on the trees along the riverbank is transparent, crystal and exquisite which forms a fabulous world for you.